Acclaimed Android and iOS VoIP Clients3CX features native Android and iOS VoIP clients that are continuously updated and tested and set the standard for mobile phone VoIP clients. With an inbuilt tunnel to avoid remote firewall issues, calling from over 3G or from any Wifi hotspot is extremely reliable. 3CX Android and iOS clients fully support PUSH, allowing the phone to be on standby and save battery life. Use Your Extension From AnywhereWith the 3CX VoIP clients for Android and iOS you can take your extension wherever you go. 3CX delivers the one number concept meaning that you no longer have to give out your mobile number. Set your status so your colleagues can see whether or not you are available to take a call. 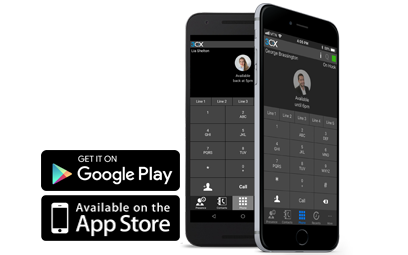 Easy to Configure and ManageThe 3CX clients for Android and iOS utilize VoIP and are easy to setup and manage. The clients can be automatically provisioned from the 3CX Management Console, reducing help desk calls. Because of the inbuilt tunnel, the 3CX clients work seamlessly across all firewalls, making them even more reliable. CALL ZEST NOW TO FIND OUT HOW WE CAN GIVE YOU A PROFESSIONAL TELEPHONE SYSTEM ON YOUR MOBILE AND STOP YOU LOSING OR MISSING CALLS WHILST ALLOWING YOU COMPLETE FLEXIBILITY TO BE WHEREVER YOU WANT TO BE.